It was not necessarily an obvious choice for a student of architecture and urban planning to submit her thesis to Netspar. “I just happened upon Netspar and the thesis awards by chance,” says winner Wendy van Kessel. “But the topic of my thesis had many areas that overlap with retirement financing. My research was on how spatial development can contribute to making a city livable for older people. I was looking at it not so much from the question of ‘How do we pay for it all?’ but more from the healthcare perspective. In the end it still comes down to the economic aspect: Planning ahead to provide an amenable living environment for older people can considerably reduce healthcare costs down the line. An ounce of prevention is worth a pound of cure. “My thesis is based on a design research project I conducted at various locations in Amsterdam. The most important finding of my research was that in order to motivate people to move out of their homes when the time comes, you have to provide sufficient neighborhood housing opportunities. People prefer to stay in their own neighborhood. There is also a great need for customization. Ideally, you would subject every neighborhood to an analysis to see what facilities are needed and ensure that every area has suitable housing for older people. That can save society a great deal in the long run. Click here to see the visual text of Wendy’s thesis. 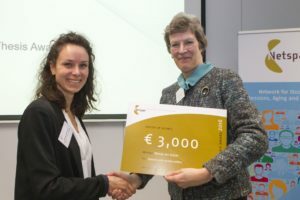 The objective of the Thesis Awards every year is to bring young people into contact with Netspar and give students an opportunity to showcase their thesis for a broader public. Netspar congratulates all of the winners on their outstanding performance! Read more about the thesis awards here.